I shared this on my Facebook Fan Page this morning (Don’t forget to “like” my FB page! ), but before we begin this throw-down, I’ve got to share with you one of the most hilarious posts I’ve read in a very long time. Anna over at My Life and Kids poked fun at me today, and I’m still peeing my pants over it. If you’ve got a minute to spare, take some time to click through. A Pumpkin and a Princess made the cutest party hats of all time. 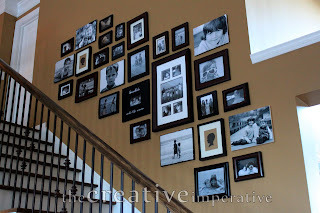 The Creative Imperative does an excellent gallery wall up her staircase. Check out these DIY cloth napkins from Copy Craft. 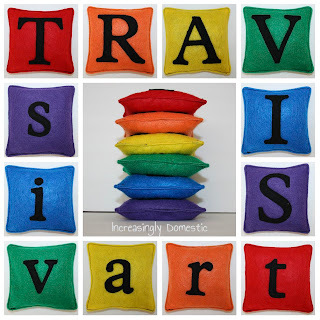 Imperfectly Polished made some super adorable throw pillows. California Dreaming is a smarty pants and used drop cloths to make her own curtains. 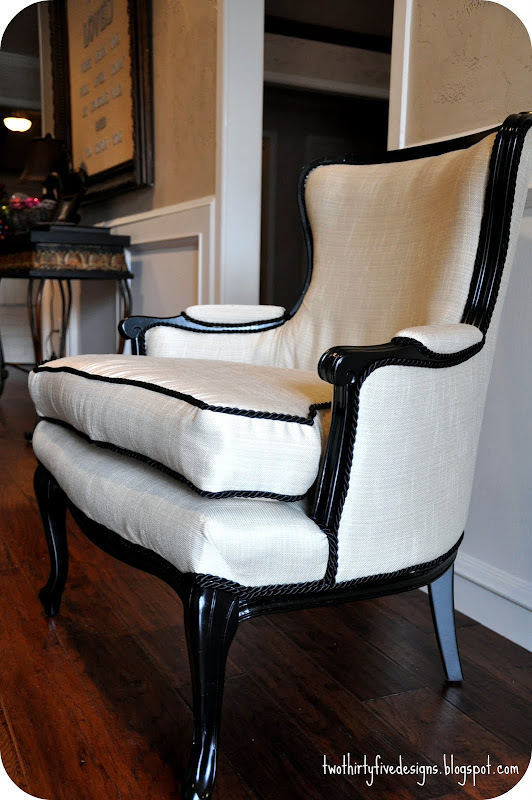 Two Thirty-Five Designs knocks my socks off with this beautiful chair makeover. I love this amazing quilt from Just Sew Sassy. Mama with a Dash of DIY Drama has more than a dash of creative talent with her DIY gear art. 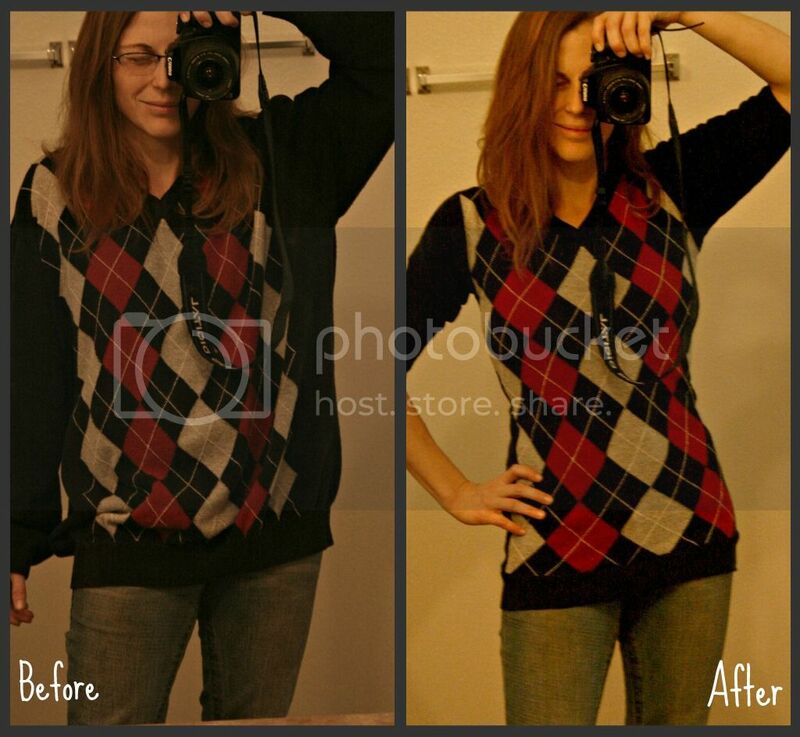 DIY Home Sweet Home turns an oversized sweater into a chic little number. I love these metallic letters Life as a thrifter spray painted. 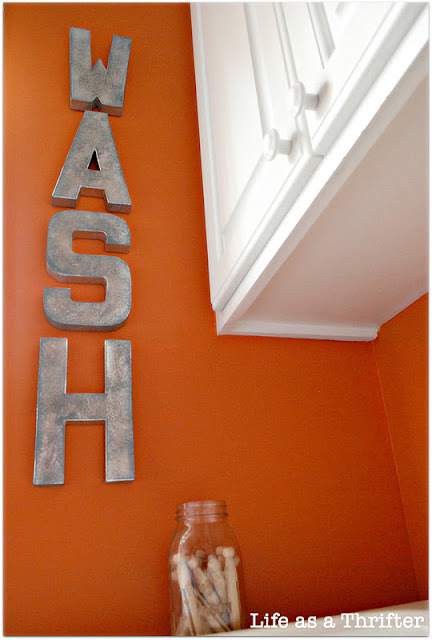 They look so good in that fab orange laundry room. The Crafty Scientist is crafty alright. 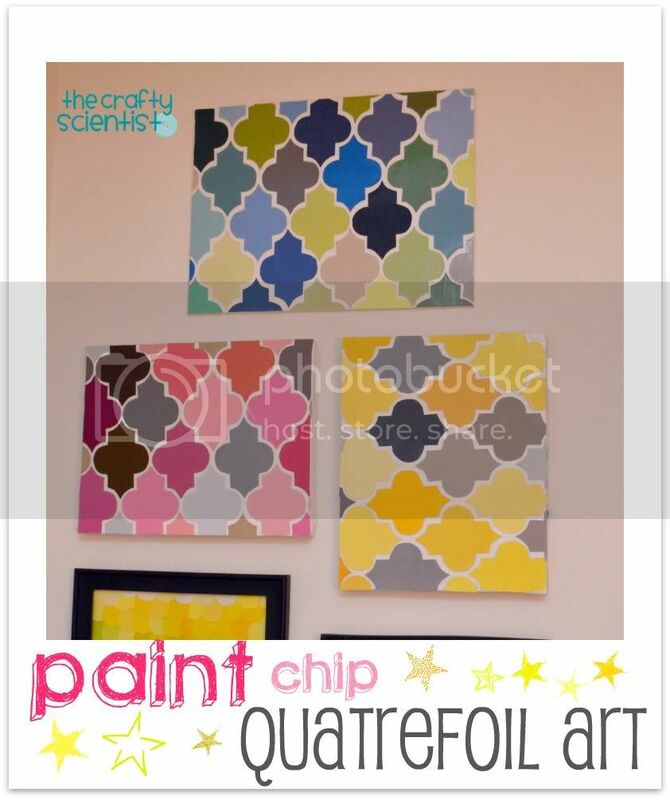 This quatrefoil paint chip art is one of my favorite paint chip projects! 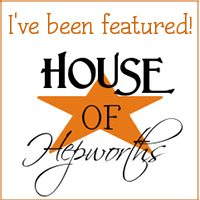 Aww….HUGE thanks for featuring my chair revamp!!! Thanks for the fab party!!! I read Anna’s post! Too funny! Thanks so much for hosting Allison! Thanks so much for the feature! What a wonderful surprise! Have a grand rest of the week! Thank you so much for hosting! Have a great week! I loved Anna’s post! Hilarious! Thanks for hosting! This is my first time Hookin Up! I love those party hats! I saw those drop cloth curtains when I visited California Dreamin’ a few days ago. She inspired me to go get some dropcloth which is sitting in the dining room waiting for me to make curtains! Thanks for hosting. Thanks for hosting! Anna’s post cracked me up, great way to start the day! Alison! Thanks so much for the intro to My Life and Kids! I am looking for more bloggers like her…send any other awesome, funny, crazy, zany bloggers my way ANYTIME! HOWDY Partner! Thanks for hosting another party. It’s always fun to link up with you and see what your huge audience has been up to in the last week. I added my Easy Lace Shirt which is, well, it’s easy- to make! Thanks for hosting…I’d like to invite you to my first linky party this Saturday @CountryMommaCooks..Hope to see you there! Opps!!! Guess I should make sure I am in the right area. Posted 2 of my projects in the Food linky party. At least I’m not alone. Noticed others did the same thing. Thanks for hosting this fab Linky!!! I am a newbie to your party and it’s fantastic! I’m also new at linking up but I finally learned how. I also figured out how to add your button to my blog. Whew! Now I’ll be able to do it again next time without hesitation. Blessings from Bama! Thank you for hosting, off to visit many of the great links! I am so excited to have found your blog this morning. What a great party and links!! Thank you for hosting.